You are invited to the greatest celebration of the year! 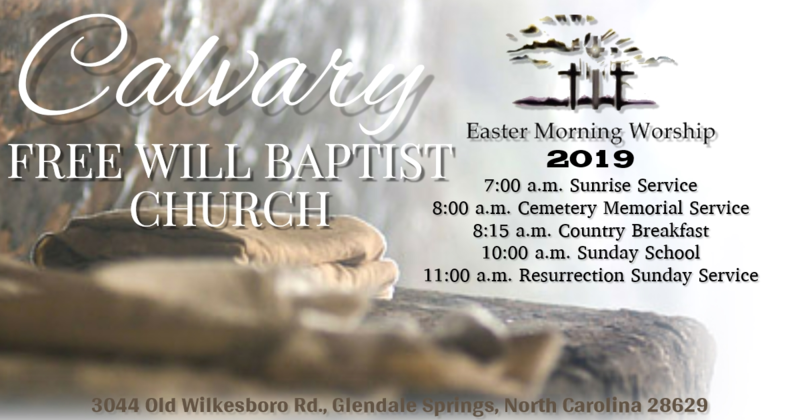 Join us here at Calvary Free Will Baptist Church for Easter Sunday worship and festivities. We will begin at 7:00 a.m. with our annual Easter Sunrise Service and then a short Cemetery Memorial. That will give us time to build our appetites so we can enjoy a delicious Southern home-cooked breakfast in our Fellowship Building. You’ll love the homemade biscuits, sausage and chocolate gravies, eggs, bacon, sausage, jams, juices, milk, and coffee. We’ll head back to the church for a special 10:00 a.m. Easter Sunday school hour. At 11:00 a.m., during our main Easter Worship Service you’ll enjoy the singing of Sister Dianne Hitt, the Calvary Choir, and Michael Combs Ministries and the preaching of Pastor Sonny Thomas.